Spiders are familiar to everyone. They are closely related to ticks, mites, and daddy longlegs, all of which have eight legs and two body regions. Insects, on the other hand, have six legs and three body regions. Some people have the idea that all spiders are poisonous or dangerous to handle, but this is not true. The only spiders found in Indiana capable of inflicting serious injury to humans are the black widow and the brown recluse or “fiddleback” spider. Neither spider will bite unless disturbed. Spider bites are rare but are often falsely implicated - even by medical professionals. There are nearly 400 species of spiders in Indiana. They live almost everywhere, including inside homes and buildings. Spiders feed entirely upon living insects or animals small enough for them to catch. They usually lie in wait for their prey, and many build webs to trap them. The webs are made of fine silken threads produced by “spinnerets” located near the end of the spider’s abdomen. The silk is secreted in liquid form, which hardens when exposed to the air. Spiders use the silk not only to make webs, but also to line their nests, construct egg sacs, and make “parachutes” on which some species travel for great distances. Spiders reproduce by laying eggs contained in an egg sac. These sacs are usually ball-shaped and may be carried by the female wherever she goes. Some species hide their sacs in the web or tuck them away elsewhere. Egg sacs frequently contain several hundred eggs. 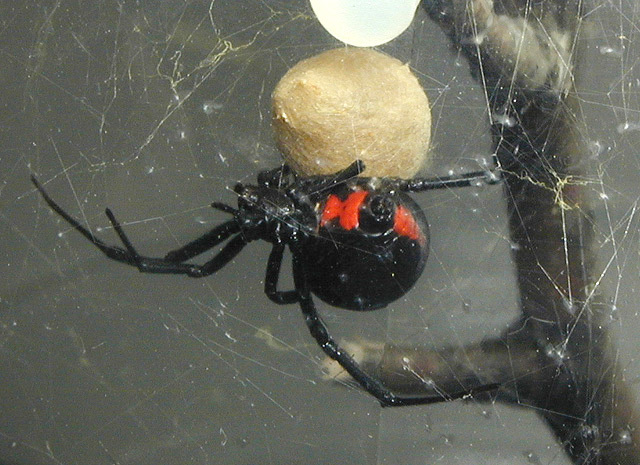 The female black widow is jet black in color and, with its legs extended, would about cover a penny. The abdomen is spherical and, in the female only, is marked on the underside with a red or yellow “hour glass.” There may be a few red spots also on top of the abdomen. The poison of the black widow affects the nervous system of humans. Persons bitten may experience a variety of symptoms, such as dizziness, blurred vision, breathing difficulty, nausea and severe pain around the wound. In such instances, a physician should be contacted immediately. The black widow lives in undisturbed locations, such as under rocks and boards, and in and around old buildings. She is active on her irregular web during the day. 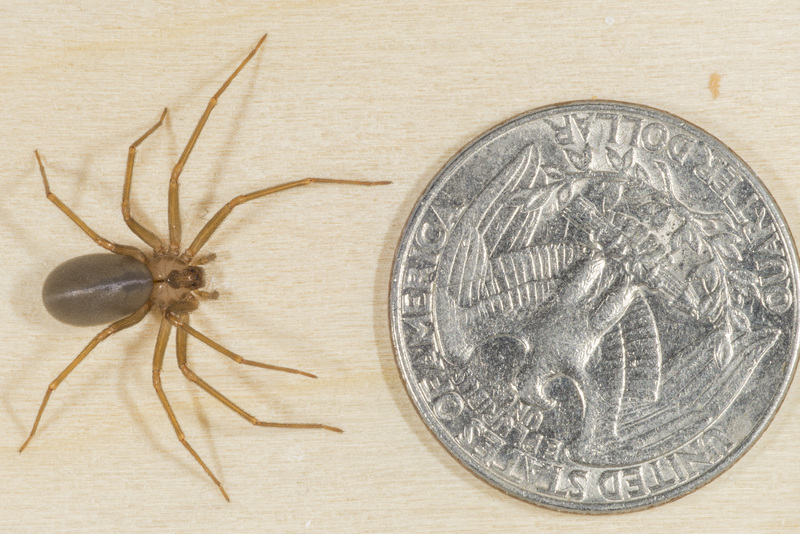 The mature brown recluse spider has a body about 3/8 inch long and 3/16 inch wide. The leg span is about the size of a half dollar. The overall color is light tan to deep reddish brown. The distinguishing mark is a darker contrasting brown fiddle-shaped area on the front half of the back. This marking is why the brown recluse is often referred to as the “fiddleback spider”. The bite of this venomous spider can cause serious effects. It is especially dangerous to children, the elderly, and to those in poor physical condition. Contrary to some reports, fatalities from bites of the brown recluse are very rare. Reaction to the bite varies considerably and depends upon the amount of venom injected and individual sensitivity to it. Extreme pain may follow almost immediately after the bite, or the bite may not be noticed for an hour or more. The visible sign of recluse poisoning is a small white blister at the site of the bite. The affected area enlarges, becomes inflamed, and the tissue is hard to the touch. Eventually the affected tissue is killed and peels away, leaving a sunken, ulcerating sore up to the size of a silver dollar. The healing process is slow, requiring 6-8 weeks; in fact, skin grafts may be needed for complete recovery from the ulcerated sore. It is extremely important, therefore, to get medical attention as soon as possible. Although no specific antidote is available, prompt medical treatment can prevent severe reactions and lessen the long-range effects. 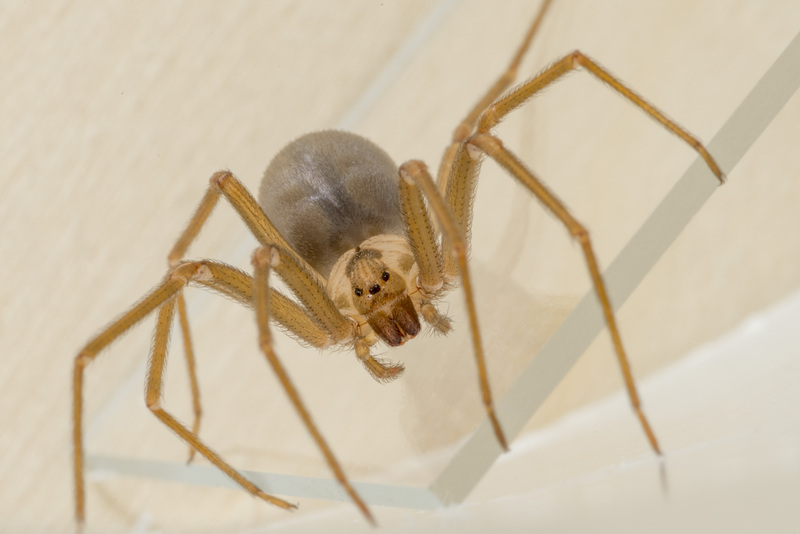 The brown recluse is aptly named because it is a reclusive animal. It is usually found in barns, sheds, garages, or even in homes that are dry, littered, and contain a supply of insects to serve as food. Favorite hiding places seem to be the arms or legs of garments left hanging undisturbed for some time. People are sometimes bitten while sleeping in beds that have been unoccupied for a long period. Most spiders can live for several months without food. Therefore, controlling the insects upon which they feed is a very slow control technique. Sanitation is the most practical method of spider control. Clean away all webbing with a vacuum cleaner so that eggs and spiders are picked up and destroyed. Ordinary housecleaning with a cloth, dust mop, or broom is not effective. Keep premises free of unneeded, undisturbed clothing, papers, and other litter. Many spiders may be excluded from the home by caulking or otherwise eliminating cracks and crevices around the foundation of the house and around windows and doors. Chemical control using a long-lasting residual spray containing a pyrethroid insecticide is effective when applied around the outside of the home and in undisturbed locations in the house where spiders are likely to be found. Check labels of specific insecticide products for active ingredient listings. Aerosols, mists, or fogs containing synergized pyrethrins or related synthetic pyrethroids can also be used for control indoors where residual sprays are not desirable. Outside areas usually needing attention are porches, garages, and eaves of the roof. Spiders may also be found in crawl spaces, basements, and unexcavated areas beneath the house. All areas where spiders are found should be treated.